From the Back Cover&colon; The Full Life Study Bible gives you everything you are looking for in a Bible -- practical, application-oriented notes on nearly every page, as well as in-depth study helps to increase your understanding of God's Word. Included in this Bible are today's most popular study tools; a complete cross reference system, easy-to-read maps and charts near the texts you are studying, informative book introductions, a detailed subject index, a concordance, and 16 full-color maps with a handy map index. The Full-Life Study Bible also includes these unique features specifically designed for Spirit-filled Christians. Themefinders: 12 symbols located in the margin indicating verses that address specific themes such as: Baptized in/Filled with the Holy Spirit, Gifts of the Spirit, and Healing. Study Notes: Bring a practical focus for deeper understanding. Articles: 77 articles that address a wide variety of topics of doctrinal and particle importance. Charts: 5 charts uniquely designed for this Bible, such as Old Testament, Prophecies Fulfilled in Christ. 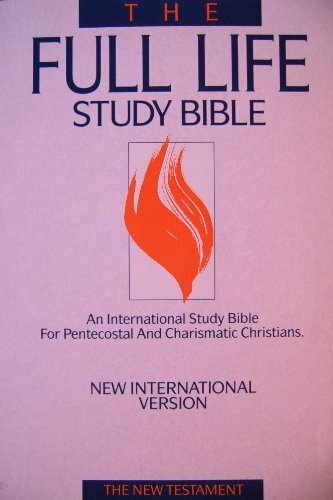 The Full Life Bible Study was written and reviewed by pastors and scholars who were committed to creating a standard by which Spirit-filled Christians could study, preach, and teach.